The scholar's mug with slide lock lid features a stainless steel outer wall accented with your choice of colorful vinyl sleeve with white stitching. BPA free. Minimum of 25. One time setup $25. 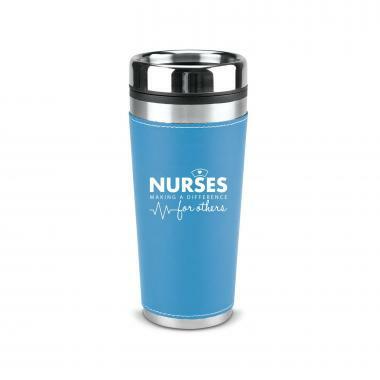 We're currently collecting product reviews for Nurses Making a Difference 16oz Leatherette Tumbler. In the meantime, here are some reviews from our past customers sharing their overall shopping experience.